Thanks for wanting to know more. Other pages on this site speak about me professionally (download bio) and my autobiographical book contains a lot about my challenges, the lessons I learned and activities you can practice to save you time and pain. But this is a place for a little personal history. 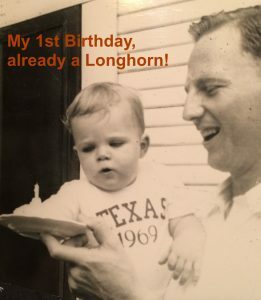 Born in Beaumont, Texas in 1948, I was bred to be a UT Longhorn (that’s my Dad and I on my first birthday). I grew up through high school (senior picture to the left) in St. Albans, West Virginia (Go Red Dragons!). True to form, I spent 10 years at The University of Texas at Austin (Hook’em Horns!) where I received a BA in computer science and psychology and a PhD in educational psychology. I was President of AΦO, the national service fraternity, and received an Outstanding Student Award – both of which I am very proud. After teaching a few years at various Texas universities I moved to Houston in 1980 to establish a private practice as a counseling psychologist. That evolved into co-founding Resource International, a leadership training and coaching firm with my best friend Stephen Haslam, and later to co-founding OH! Educational Services, which provides character education programs for school and home, again with Stephen and another good friend Dot Woodfin. Along the way I was married twice, 1st time divorced after 7 years and the second widowed after 30 years. The last two chapters in my book discuss the love we shared and the lessons I learned. I have three step-daughters and four grandchildren all of whom I love very much. I have been very fortunate to have my amazing parents, Bob and Frances, living with me, which allowed us many opportunities to care for each other. To the left is our last Pennington family reunion picture (there were about 30 other relatives there, too) with my parents, my sister Ann and her family, my wife Clair before she passed away and our children Lucy and Mary and their families. This recent picture is of me and my youngest grandson, Charlie Bob! I’ve spent 40 years being curious about how thoughts affect emotions, which in turn influence behavior and produce results, either effective or ineffective. I have explored the twists and turns of this mystery through many years of studying psychology, comparative religion, even Egyptology to find those common threads of truth that have existed throughout time. I even selected a logo, The Chartres Labyrinth, many years ago to help me stay focused on this journey of discovery. I’m happy to share what I’ve learned to help you make your path smoother, easier and more effective.